Disclaimer: Wait! STOP! Before you attempt to read this further, make sure to take everything at face value alone. Though we have run every authenticity check we could think off, it does not mean that this News can be basis for further assumptions. I cannot possibly stress the importance of not blindly following a distant leak source no matter how authentic it appears. The only reason i have not tagged this post as a RUMOR is because i have yet to find any sign of forgery or fabrication. Massive Skepticism, Brain, Jar of Salt. Ok, you are good to go. We have just received tips from some of our Chinese readers that the Nvidia Flagship GTX 780 Ti ran into problems in the Chinese locale, causing GPU Deaths, allegedly, one actually blew up. The sources they have given us (given below) also have alleged evidence of Chinese suppliers suspending GTX 780 Ti Sales in their specific areas. The alleged poster is in Chinese and appears to be saying the same. 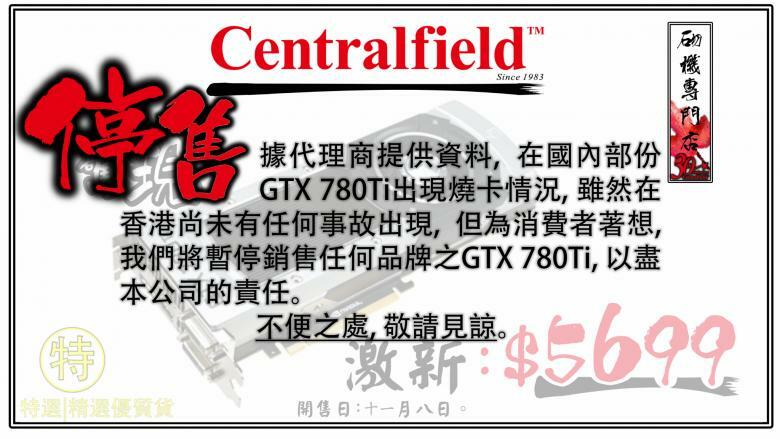 The Chinese supplier in the poster is ‘Centralfield’. 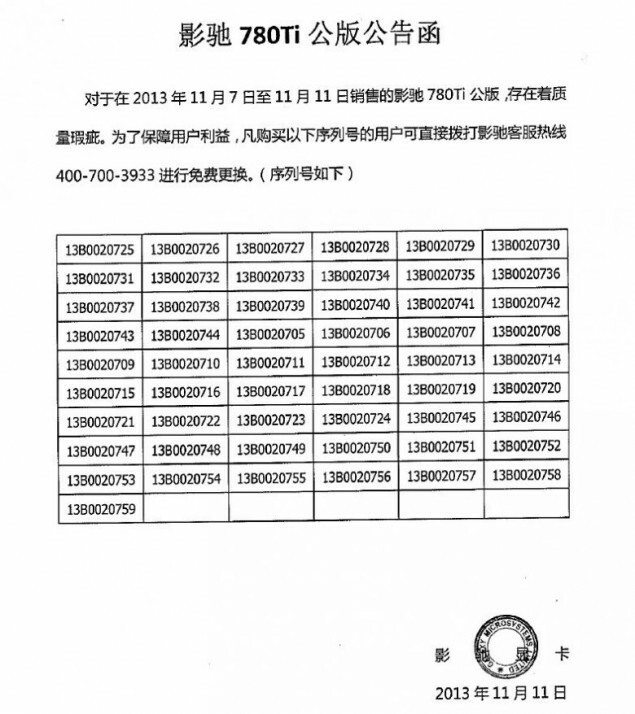 GTX 780 Ti Possibly Being recalled in China – Burnt Units associated to Alleged Design Flaw. In a shocking email a Chinese Reader told us that GTX 780 Ti units in the Chinese locale are hitting a snag. One of them even apparently blew up. He further directed us to alleged evidence that the GTX 780 Ti was being recalled and its sale suspended. The posters are in Chinese. According to our Chinese friend this says something along the lines of dead/burnt GPU and GTX 780 Ti sales suspended. Further more the same Chinese source also claims that Galaxy has acknowledged the malfunctioning batch and is recalling said batch and promising replacements. If this is indeed true then this could be quite a snag in the Nvidia Sales department. The alleged batch of malfunctioning products is also given. We honestly aren’t sure how to proceed, things like this are pretty serious business. That said i am not going to present any form of further analysis. Doing so would violate the sanctity of our aim to providing you with authenticated and responsible news. Feel free to analyze everything as it is yourself.